One way to make our homes really attractive is through outdoor lighting. We spend a lot of time getting the yard and landscape looking good so why not make it look just as good at night? 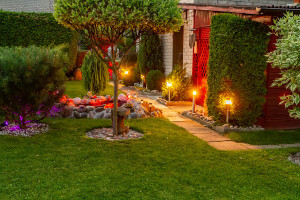 Over the next couple of posts, we will look at ways Cary landscape lighting trends have changed for 2019. We hope that you will find some of these trends that will make your home look good all day and all night. One of the hottest lighting trends for 2019 is Moroccan lights. These lights have loads of metal details that form an awesome design element when lighted up. Add these lights around your patio, deck, or pool areas to create a beautiful light display that will become a conversation piece. Check out your local farm and garden stores for some really unique pieces. A really great way to get some outdoor lighting that is not “stand out” is to use subtle wall lighting. This is lighting that is placed on the outside of your home in areas needed but they blend in. This is done by covering the lights in panels which the homeowner can then paint to match the home’s siding. This type of lighting is angled downward. This can help to enhance your path and other landscape features. Smart lights are a good security choice for your home. Newer models have a motion sensor that is activated when something or someone crosses the path. Today’s smart lights are even more advanced. They can be wireless to add to your other home security features, This includes smart cameras and other devices. This way everything works seamlessly together. Stringed lights are also a new idea in outdoor lighting. Hung by stringing them along a roof line or deck they give a great look. stuffed into a jar or lantern they look even better, The choices are endless. Some “Edison” bulbs are designed to look like lights of the 1800s. You will want to keep these lights sheltered as much as possible. They can be ruined by the weather. As technology continues to advance you might want to replace some of your older Cary landscape lighting. Solar lighting has remained popular and newer solar lighting is even more popular. LED lighting uses less energy and has become popular. They install easily and no wiring needed. Unfortunately, they do not have a bright light so you are limited in where to use them. Along a pathway or as an accent will be the best place to use them. Check back with us next post for more great ideas on what is trending in 2019 for Cary landscape lighting. You can find some good ideas on what to use to highlight your yard. Having a gorgeous lawn with beautiful landscaping is a way to attract customers to your business. It is also a way to make your home as welcoming as it can be. Lindsay Lawn and Landscaping is committed to bringing all of that beauty to our clients. 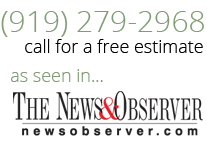 We offer all kinds of lawn services as well as landscaping to make your home or business as attractive as it can be. Call us today to talk more about Cary landscape lighting for your curb appeal. You will be so happy you did. Leave comments and stay updated by subscribing to the RSS feed.